As some of you may remember, I wrote a post about a month ago concerning the poetry of Candice Daquin. Her first poetry book was to be my first paperback purchase from writers I know. I had, and still have, been squirrelling away my pennies so that I could treat myself to some much wanted books from friends. 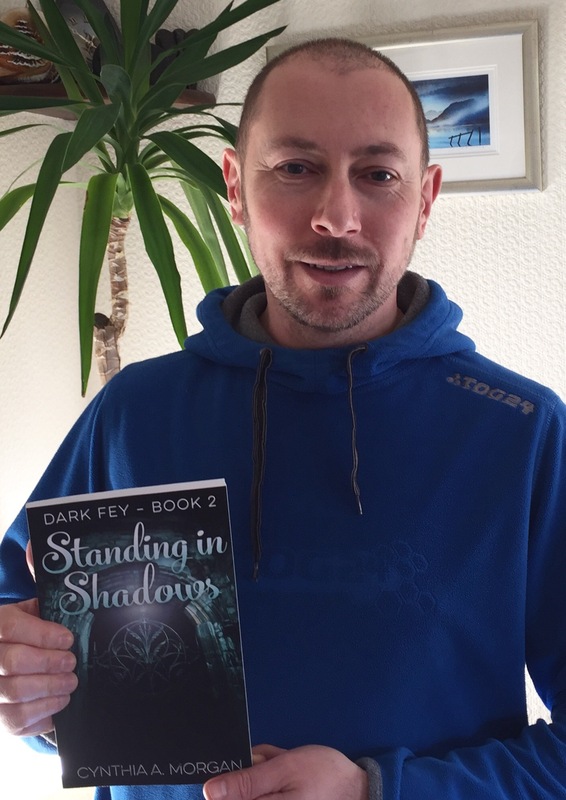 Today I received my second: Dark Fey — Book 2 / Standing in Shadows by Cynthia Morgan. I already owned book one on kindle but was determined to buy an actual copy. To say I have been waiting for it with baited breath is an understatement. However, it has arrived at last. You all know how much I hate my picture been taken, so can appreciate just how pleased I must be to allow this photo. Here I am defending The Adam Fey from my Yucca. For anybody that likes Fantasy, I would highly recommend The Dark Fey series. Book one was exceptional and like anyone else that’s read it, I couldn’t wait to get the second. Apparently, book three is well on the way — or so my connections in the business tell me, nudge-nudge, wink-wink. I think in these days of mass production, fads and recommended rubbish it is refreshing that places such as WordPress allow us the reader to have not only great books recommended to us but great books by people we know. I hope you enjoy it as much as I know I will. Guest Post: Dark Fey by Cynthia Morgan. Something a little different here today, as this post is to promote a wonderful friend and her superb new book (I have just purchased a copy myself, so I really am practising what I preach.) Morgan is a fantastic writer, please do check out the attached links for her site http://booknvolume.com and of course her book. I’ll leave the rest for the lady in question to reveal in her own words. PS If anyone did reblog this I’m sure it would be very much appreciated. 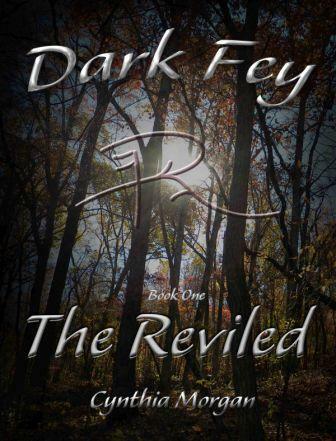 What is Dark Fey, Book One: The Reviled? And who is this ~Morgan~ who wrote it? Gosh, I’m so glad you asked! Dark Fey The Reviled is the first installment of a Fantasy genre story set in the primordial forests of mystical time in a land peopled by both Light Loving and Darkness Revering Faeriekind, or Fey, where a relationship between two unsuspecting, kindred souls, separated by far more than social stigma, blossoms in secrecy that could shatter both their worlds. Ayla, a Light loving, Guardian of Childfey hides more than a few secrets; secrets that isolate her and set her apart. Secrets that bring her to the attention of one who comes in shadow and silence; one who watches, waiting for the ideal moment to step from the darkness, reveal the truth about himself and alter the course of her life forever. What about ~Morgan~, what’s her story? First off, let me begin by explaining that my given name is Cynthia Morgan, though I prefer simply ~Morgan~ (I know, rather Madonna-esque of me). I live in a teeny, tiny little burg known as Myerstown, which is nestled into the Amish Countryside in southeastern Pennsylvania. I have been writing since childhood. I have written short stories, newsletters for various companies and have had poetry published on several websites and in book form. I am also the author of Booknvolume.com, or BnV, which I started in June of 2013.